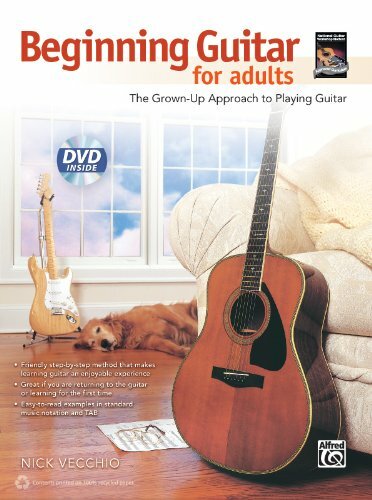 A list of materials that can help grown-ups like you and me learn how to play guitar. This list is updated on a regular basis as new material becomes available. Have a title/product to add? Please submit your suggestion and a brief review to grownupguitarist@gmail.com. Thanks! Do something nice for yourself. Learn to play the music you enjoy. Use books that don’t talk down to you. Quickly learn chords, melodies and strums, playing both with a pick and using fingerstyle technique. 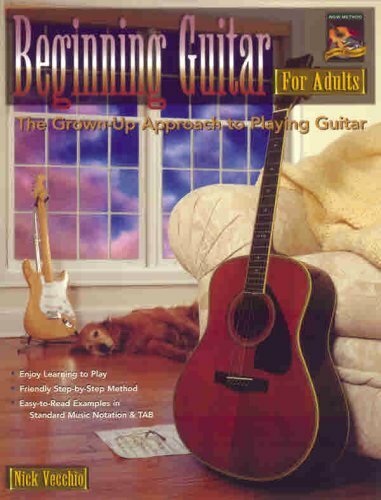 This fun introduction to guitar is great for self-learners or private lessons with a teacher. 96 pages. This fun and friendly step-by-step introduction to blues guitar is written with the adult learner in mind. It is both a great self-teaching book and a great method for use with an instructor. Blues Guitar for Adults covers scales and techniques for blues lead guitar, important blues forms—such as the 12-bar and 8-bar blues progressions—and even provides licks in the style of the most important blues guitar masters. Easy-to-read examples are written in standard music notation and TAB, and theres a special section at the end showing all the scales and arpeggios you need to play the blues. Large diagrams and detailed photographs help simplify the learning process. A CD demonstrating all the examples in the book is included, making learning easier and more fun. 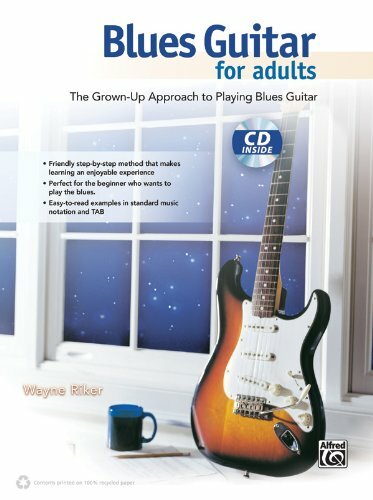 This is the perfect how to book for the grown-up who wants to play the blues! 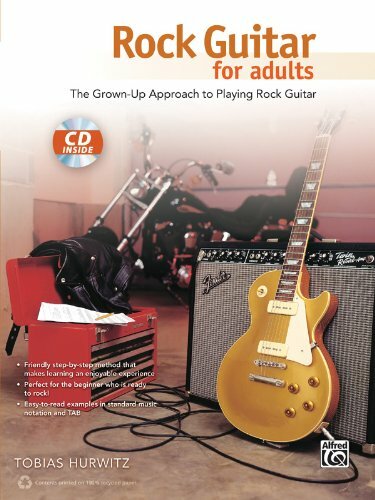 This fun and friendly step-by-step introduction to rock guitar is written with the adult learner in mind. It is both a great self-teaching book and a great method for use with an instructor. 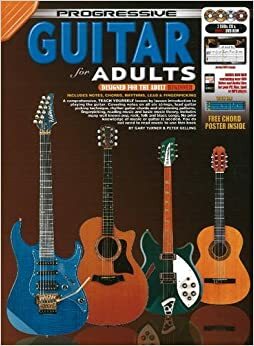 Rock Guitar for Adults covers rock chords, jamming, fingerpicking, scales and techniques for lead guitar, and more. Easy-to-read examples are written in standard music notation and TAB, and there’s even a section on music theory geared toward rock musicians. Large diagrams and detailed photographs help simplify the learning process. A CD demonstrating all the examples in the book is included, making learning easier and more fun. 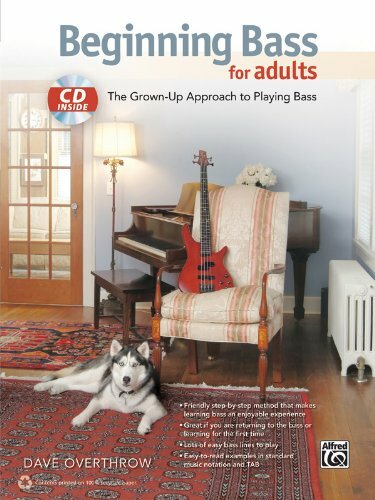 This is the perfect “”how to”” book for the grown-up who wants to rock! A simple step by step approach to learning to play guitar from scratch. Written by Wendy Brentnall-Wood, founder of Wendy’s Music over 30 years ago. Wendy is a qualified and experienced instrumentals and classroom music teacher with a passion for getting people started and enjoying music making. In Her “Learn to Play or Sing” series, Wendy shares her unique and simple step by step approach for adults with little or no musical knowledge in an easy to read and easy to execute systematic approach. 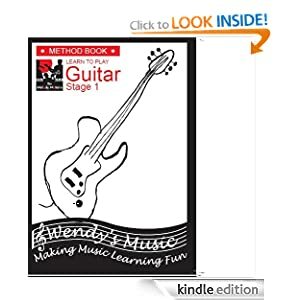 This book is the first of a series of three method books which are the backbone of learning to read music and chords whilst developing a solid technical grounding in the basics of actually playing. It is a practical and hands on curriculum that has been used successfully in Wendy’s Music Schools for many years. At the end of this book you can expect to be able to play simple tunes, and songs competently enough to enjoy a singalong with friends or family. There is so much packed into this book and disc package! 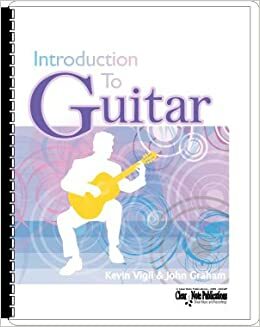 Perhaps the most of any guitar method book and disc package that’s out there. I’m talking hours upon hours of material. Two DVD’s – 1 CD – 1 DVD-ROM are included if you get the right package. You also get a pull out color poster inside the book. There are 228 pages in the book itself! The whole package weighs quite a bit. Yes… Progressive really did a fantastic job on this one! I’m not sure of the negative reviews that are out there? I would question those for sure! In my ever so growing collection of guitar books, I think this will be the last general method book I buy. It covers ALL guitar playing. Great for electric, acoustic and a little bit of classical. It’s all in there!! !